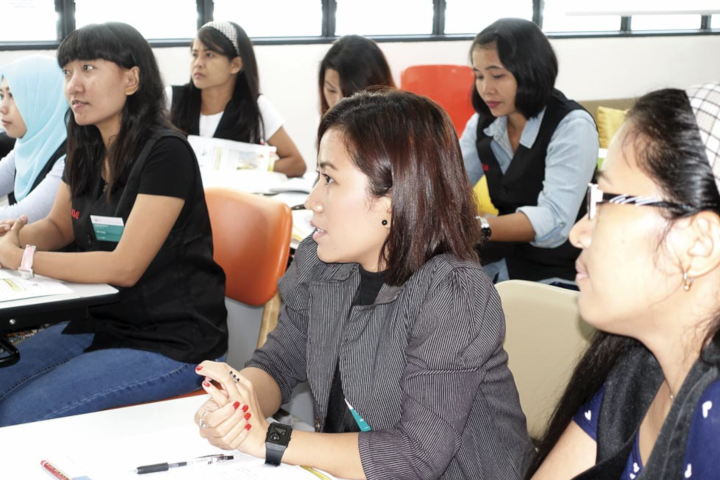 One of the universal aims among support groups for foreign domestic workers is for them to be empowered through learning financial and entrepreneurial skills to improve their socio-economic situation by the time they complete their contracts and return to their home country. Almost all the women shared that their financial situation was very tight with them living from month-to-month. They each have a personal or extended family, and almost all their monies are spent each month without any savings left. They felt it was pointless to think about saving any money, because it will be easily wiped out by a sudden need from home or for themselves here. Janelle added that prior becoming a domestic helper abroad, she had a local bank (savings) accounts in her homeland. “There are a few Filipinas who had social security services account,” she said. Together with two other women, all three of them all claimed to have continued contributing to it, and one discontinued due to hardship meeting ends. “I had no choice,” Leela said, “I also had personal life insurance taken up by my family before coming here.” Some were confident that these policies were still active. The other women who did not have any personal life insurance said that although they felt that even low cost insurance available in their home country were worth contributing to, they had not done anything to get a policy for themselves. “You know there are other helpers (who) had contributed to agencies (“cooperatives”) and were played out. The office was closed and they could not get any of their money back,” Janelle said. When asked how much they knew about life insurance, none of them were aware that it could also be a form of savings. There was a slight sense of unease – maybe morbidity – when speaking of this, but none of them avoided expressing their willingness to share their thoughts. “Without a Singapore bank account,” one of them mused, “we cannot (access some useful) banking services.” Two domestic workers who claimed they had opened POSB accounts said they used these only for the ATM access. Only one of the women said her husband has stable work in the Philippines and she maintains a “dream board” in her cupboard in Singapore, and has listed specific goals for herself to achieve when her contract ends and she returns home to permanently. Deliyah participated in learning various skills on her own time over many years being in Singapore and has volunteered to help train and teach other domestic workers. All the women expressed that same general aspiration to improve themselves and had completed at least one course with ACMI, or were involved in another centre, or planned to do another course. Most of the women had described very fractured personal family lives, compared with the “Singapore family”. Each of the women interviewed were separated in one way or another, including divorce, or were fostering their children to relatives, or had spouses who worked elsewhere abroad and they had minimal contact with them. “(But) I can tell you that we are stronger people because of this,” Mina said, adding that it was still important for them to comfort and emotionally support all of their loved ones they left behind. “I want to come back to ACMI (to teach),” Jean said, “of course, I want to improve myself and have a better future and make good decisions. But I have to be realistic.” Four of the women regularly help at a local hospice as volunteers on their Sundays off. The interviews were conducted on Sunday, 25 February and 4 March 2018 14 with female foreign domestic workers, with an above average competency in English. Ten were Filipinas, three Indonesians, and one from Myanmar, and all had worked in Singapore three or more years. All names used here are pseudonyms. The stories these women shared showed few were financially prepared for economic independence at the end of their contracts and may not have a recourse to a better life when they return home. A rare few made specific financial plans including investments and savings and they did look forward to a new career or an entrepreneurship when they returned home.